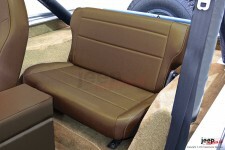 This fold and tumble rear seat from Rugged Ridge fits 76-86 Jeep CJ models and 87-95 Wrangler YJ. Tan. This nutmeg vinyl fixed rear seat from Rugged Ridge fits 55-86 Jeep CJ and 87-95 Wrangler. 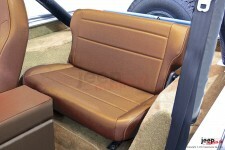 This tan vinyl fixed rear seat from Rugged Ridge fits 55-86 Jeep CJ and 87-95 Wrangler. This black vinyl fixed rear seat from Rugged Ridge fits 55-86 Jeep CJ and 87-95 Wrangler. 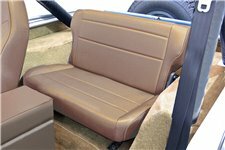 This fold and tumble rear seat from Rugged Ridge fits 76-86 Jeep CJ models and 87-95 Wrangler YJ. Gray. 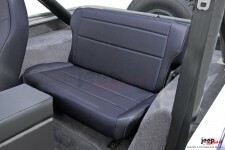 This fold and tumble rear seat from Rugged Ridge fits 76-86 Jeep CJ models and 87-95 Wrangler YJ. Nutmeg. 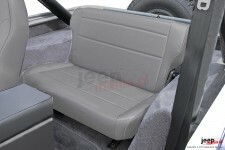 This fold and tumble rear seat from Rugged Ridge fits 76-86 Jeep CJ models and 87-95 Wrangler YJ. Black . 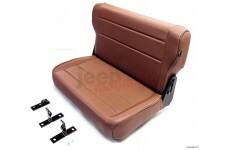 This fold and tumble rear seat from Rugged Ridge fits 76-86 Jeep CJ models and 87-95 Wrangler YJ. Black Denim. 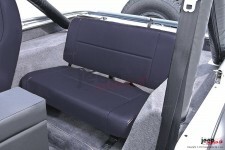 This fold and tumble rear seat from Rugged Ridge fits 76-86 Jeep CJ models and 87-95 Wrangler YJ. Spice. 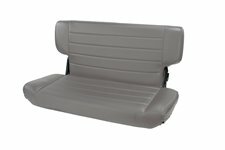 This standard replacement rear seat from Rugged Ridge has the fold and tumble feature. Fits 97-02 Jeep Wrangler TJ. Gray. This standard replacement rear seat from Rugged Ridge has the fold and tumble feature. Fits 97-02 Jeep Wrangler TJ. Black Denim. 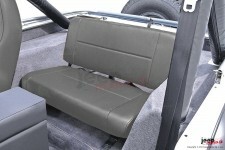 This standard replacement rear seat from Rugged Ridge has the fold and tumble feature. Fits 97-02 Jeep Wrangler TJ. Spice. This fold and tumble rear seat from Rugged Ridge fits 76-83 Jeep CJ5, 76-86 CJ7, 81-86 CJ8, and 87-95 Wrangler YJ. Spice.